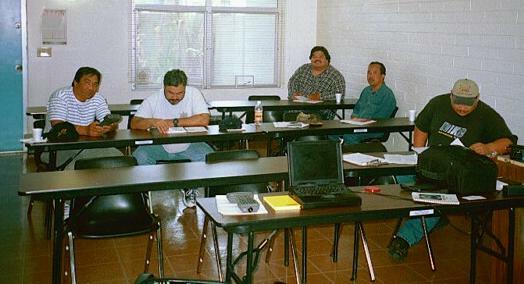 In April, 2002 Navaids trained staff of Guam's Telephone Authority in the operation of their Ashtech RTK system and Criterian laser distance measurer. 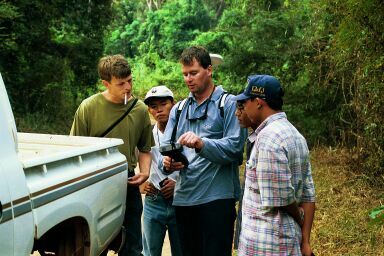 The Laser was used in conjunction with the GPS to map features that were under heavy foliage or under building eaves. An overhead projector connected to a laptop was used to demonstrate the associated software to students on the course. 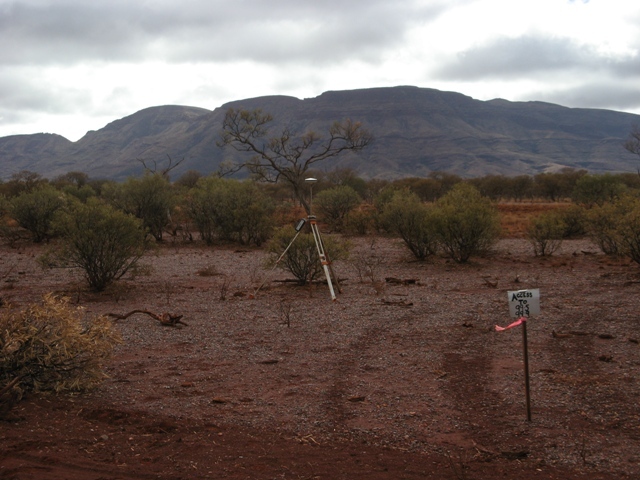 Craig from Anaconda Nickel Ltd (top right) is carrying out a photo control survey. 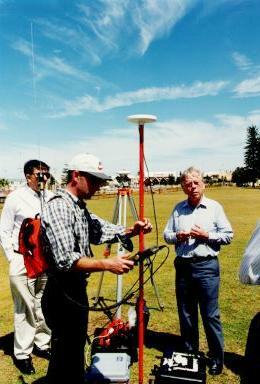 That small white patch which the tripod is setup over is visible from existing aerial photographs. A three dimensional position is obtained for this point along with other points in the same photograph. 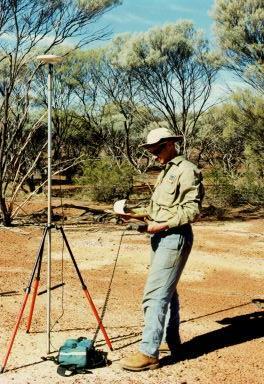 These control points re used to orientate and scale the photographs so that they can be used for mapping. 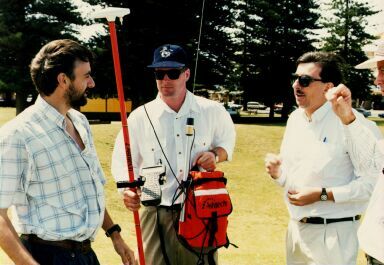 Navaids staff demonstrating the Ashtech GG-RTK System at the International Survey and Mining Expo held in Fremantle, Western Australia. The Ashtech GG-RTK Receiver is a Dual Satellite System (the American and Russian Satellite systems) that provides reliable centimetre-level precision in real-time. It can achieve this in extreme environments such as in-between tall buildings or at the bottom of a deep open cut mine. With more satellites to use there is more chance of receiving enough satellites for carrier phase differential and it also speeds up the process of fixing the integers. At one stage during the day there were a total of 19 satellites available; this is quite remarkable when most GPS operators find they only get 10 or 11 at the best of times. 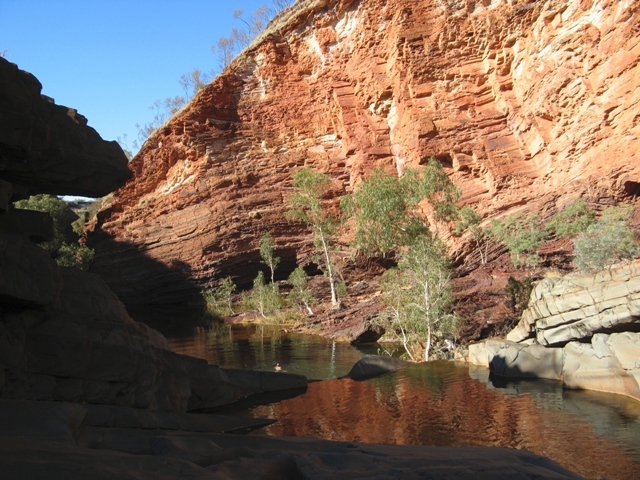 Feature in the Pilbara region of Western Australia. Butcherbird Copper Mine - part of a Montezuma owned tenement. 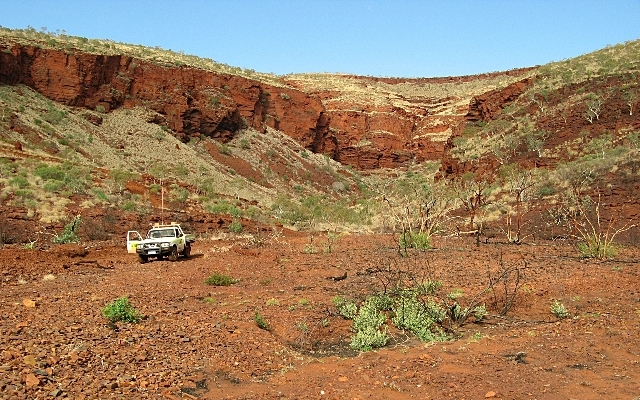 Some of the magnificent scenery in Pilbara region.